The New Delhi based Ambassador for the Republic of Poland to Sri Lanka Tomasz Lukaszuk met the Chairperson and CE of EDB Indira Malwatte on Monday (23) in Colombo. The discussion centred on the Polish participation at the World Export Forum to be held in Colombo in October this year. The Ambassador said that he is very keen on bringing down a large delegation for the event and to organise an objective driven B2B meeting program for the delegation. Sri Lanka is well known as a tourist destination and for its quality teas, he said. He also emphasised the need for engagement in other prospective areas. Poland is keen to look in to both trade and investment prospective, the Ambassador said. Agro processing, boat building, home appliances, ceramics, green technology and ICT are the mutually benefiting sectors for both the countries to explore for trade and investment promotion. 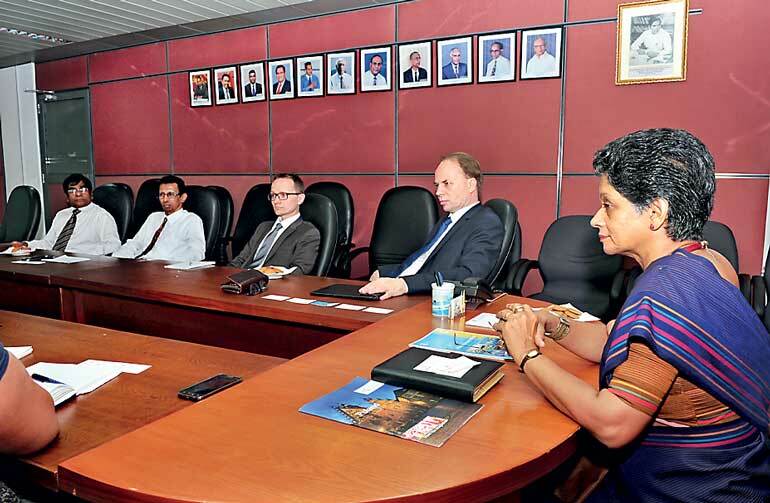 Reciprocating the Chairperson and CE of EDB Indira Malwatte welcomed the idea of organising B2B program for the visiting trade delegation to the WEDF 2016. She also said that the EDB and the ITC are ready to organise B2B sessions on Tuesday 11 October the day prior to the Forum at the BMICH. Importance of a follow up outward trade delegation from Sri Lanka to Poland next year was also discussed. EDB also made a presentation on WEDF 2016 to the Polish Ambassador detailing the arrangements of WEDF 2016. The World Export Development Forum (WEDF), the flagship event of the Geneva-based International Trade Centre (ITC), will be held in Colombo, Sri Lanka, on 12-13 October. WEDF will bring together more than 600 policymakers, business leaders, and officials from trade and investment support institutions (TISIs) and international organisations to discuss how to achieve sustainable and inclusive economic growth through trade. A series of business-to-business match-making events will also be held over the two-day meeting, allowing participants to create business linkages across sectors and across countries. The Deputy Head of Mission at the Polish embassy,WEDF Steering Committee representatives from the trade chambers viz National Chamber of Exporters of Sri Lanka, The National Chamber of Commerce of Sri Lanka and Chamber of Young Lankan Entrepreneurs (Coyle) were also present at this meeting.